Is snoring keeping you or your loved one awake at night? Has a doctor diagnosed you with sleep apnea? We may have a solution. Everyone deserves a restful night of sleep. Over 20 million people share the ongoing problems of snoring and sleep apnea. Snoring and sleep apnea are caused by the narrowing or collapse of the airway during sleep. The airway becomes constricted when the muscles that keep the airway open relax during sleep. Snoring is the sound we hear as air rushes through the narrowed airway passages which causes the soft tissue around the airway to vibrate. In many cases the collapse of the airway can be prevented by repositioning the jaw. Bakersfield dentist Dr. Mark Phillips can fabricate an oral appliance that will reposition your jaw so that air will flow more freely which will eliminate snoring, allowing for a more peaceful night’s rest. Snoring can also be related to a much more serious condition known as sleep apnea. In addition to awakening numerous times a night due to a blocked air passage, there are other side effects that are a result of having periods of low blood oxygen during sleep. Health issues that are associated with inadequate sleep include: depression, anxiety, high blood pressure, congestive heart failure, fibromyalgia, coronary heart disease, stroke, mood swings, impotence and acid reflux (GERD). Many sleep apnea sufferers snore, but many do not snore. Those who suffer from sleep apnea may have periods during sleep where they are awakened when their airway is not only constricted but may completely collapse causing gasping or choking. The most common sleep apnea symptom is daytime sleepiness, and the feeling that the sufferer never seems to get enough rest. Other symptoms may include morning headaches, high blood pressure and cardiovascular disease. Sleep apnea is a medical condition that is diagnosed by your physician. To diagnosis this condition a sleep study, also known as a polysomnogram, would be administered to measure your sleeping characteristics such as sleeping patterns, breathing rate and oxygen levels in your blood. Your physician may diagnosis you with either central or obstructive sleep apnea. Central sleep apnea is a condition that originates in the brain and is treated by your physician. Obstructive sleep apnea (OSA) results when the soft tissues in the throat collapse as the body relaxes during sleep. In mild to moderate cases of obstructive sleep apnea, Dr. Phillips can construct an oral appliance, similar to a sports mouth guard, to help reposition the lower jaw forward to allow the tongue to posture away from the throat and open the airway. 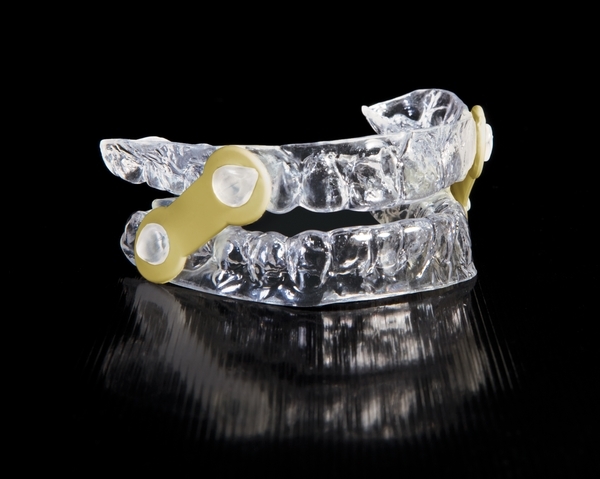 The American Sleep Disorders Association (ASDA) has endorsed the use of oral appliance therapy as one of three accepted treatment methods for snoring and obstructive sleep apnea. Dr. Mark Phillips has unique training in the care and management of snoring and sleep apnea. His specialized training includes a Mini Residency in Sleep Dentistry at UCLA Dental School. Call for a consultation today if you are seeking relief from snoring, or suspect that you may have sleep apnea. A consultation with Dr. Phillips may result in unimagined overall health improvements. Snoring - An oral appliance is a remarkably inexpensive and affordable device. Please call and ask one of our dental professionals for more information. Sleep Apnea - Many insurance companies will reimburse for oral appliances since sleep apnea is a medical condition. Call Phillips and Jue Dental today for a consultation with Dr. Mark Phillips at 661-323-1500.